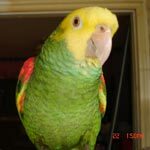 Parrot Forum • View topic - can i even risk getting a free flight bird? can i even risk getting a free flight bird? I'm considering getting my first budgie, but I'm worried it would be completely incompatible with my home. I live in a townhouse, with a partial wall that separates the living room and kitchen- leaving a high open ledge under the vaulted ceiling. Every room in the house (except the bathrooms) have a random high ledge on one side below the ceiling. I keep seeing over and over again that budgies shouldn't be clipped, but I can't imagine one NOT taking advantage of those high spaces and never coming down. What do I do? Re: can i even risk getting a free flight bird? They do love high places but also want time with their flock humans. If he is bonded to you he will want to spend time with you as well as the high perches.